Prompt, professional and helpful service with great advice on some issues we had. Will request their work again. Already recommended to others. Thank you, Chris and Mitchell! It's always nice to get a review! Thanks for taking the time, all the best. Chris and his son were exactly the type of people that you want working on your house. They return calls/message right away, show up on time, do exactly what they say they'll do and clean up as if they had never been there. It also helps that they were friendly and very accommodating. Will use them again and and wouldn't hesitate to recommend them. Thanks John, it's appreciated and always nice to hear, all the best. We booked Metro Chimney to come to our home to do a much-needed cleaning, and to do an inspection for any other work needed. Owner Chris and his son Mitch showed up and did a fantastic job, complete with images shown of what was done. The chimney trap was practically non-existent and was replaced. The further work recommended is not at all urgent, but was thoroughly explained. 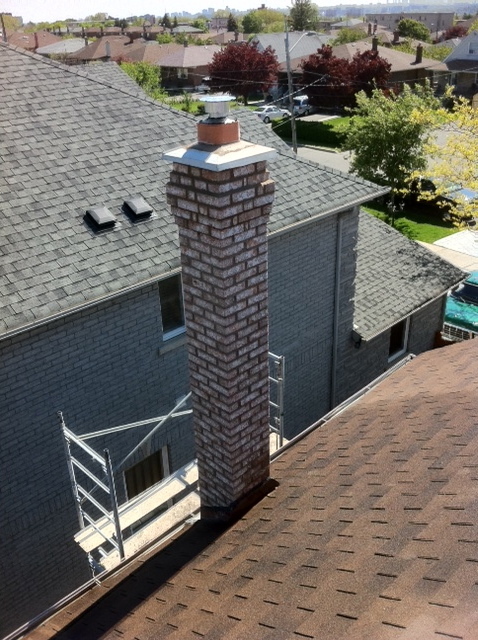 We couldn't be happier and highly recommend Metro Chimney to everyone in the GTA, including Oshawa where we are. Thanks Chris for this great review, enjoy the fireplace, all the best. This is the second time I've used Metro Chimney -- the first time to clean my chimney and years later to replace the original chimney with a new one. I've had outstanding service both times. His quote is reasonable and his invoice matches it. 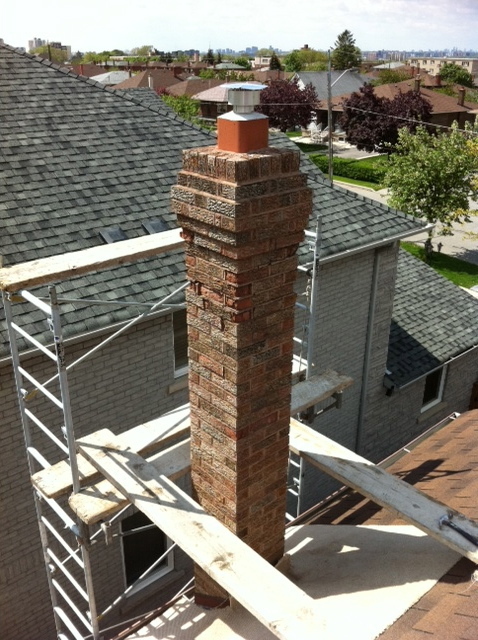 He and his crew showed up as scheduled, ensured that they connected to my neighbour, completed the job on time and provided me with a wonderful new chimney that blends in perfectly with the style of my older house. 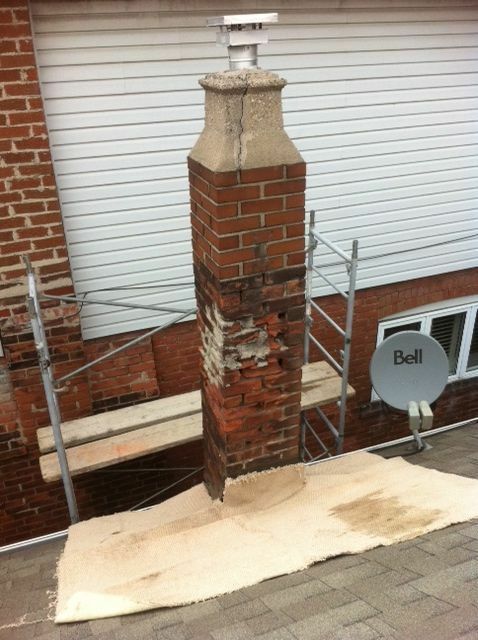 I highly recommend Chris and his team for chimney clearing, repairs or new construction. Thanks for the review, it was a pleasure working with you, thanks. Chris and son Mitch were a pleasure to have at our home today to fix the flue tile, install missing rain cap, and check the chimney for critters. Chris had explained in detail when providing the quote what the possible scenarios and costs could be, which seemed very reasonable. We were thrilled when he could start the work the next day and arrived on time as scheduled. Turns out there was an old nest with dead squirrel part way up the chimney-- (Thank you Mitch). These men are thorough, knowledgeable, honest, polite, and tidy. We are happy clients who wouldn't hesitate to use them again. Thanks!! Thank you Susan for taking the time to write this review, it was a pleasure meeting both you and your husband, one of the cool things about this job is meeting people like yourself! The nest was challenging to remove but Mitch did a great job and didn't make a mess! Before my chimney fell and killed someone in my family I asked Chris of Metro Chimney to come to the house and have a look. He arrived as arranged and told me exactly what needs to be done, how long it will take and the cost. Several others also were contacted but no response. Chris arrived in the morning that we arranged with his son Mitch and began the dismantling of the existing chimney and began what seemed to be an easy job. To my surprise the care he took in preparing for the job was extraordinary. Drop sheet and scaffolding was set up all around protecting the site. 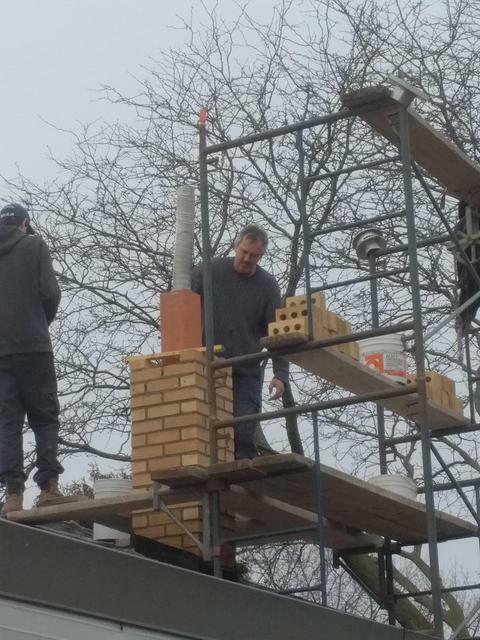 He and his son took care and with extreme skill erected a new chimney in 2 days as promised. They were able to match the existing brick 100%. They found a few things that also needed attention but No extra cost for this. The job is beautiful and we are extremely happy with the out come. Thanks Len for taking the time to write this review, it was a pleasure meeting you and your Dad, all the best to you both. I'm so pleased with the quality service provided by Chris and his son Mitch. Very knowledgeable and informative about the job and next steps. The job was done in a very professional manner and the area was left clean. I will definitely be recommending and calling Chris for future service. The customer service was outstanding. We are very pleased! Thanks Mike, happy to hear that you are pleased with the work and for taking the time to write this review. Professional and courteous. Chris and his son, Mitch, arrived right on time, were very efficient and well equipped. I would highly recommend this company. I feel they are very honest, thorough and experienced. My chimney was very dirty(sooty) so now I feel more secure using my fireplace this winter. Thanks Caroline, Mitchel has come a long way, All I really did was watch the van and check his work, it's nice to hear, all the best. From the quick response to my request, rapid appointment, pre-arrival courtesy call through to the clean and friendly service, Metro were really great to deal with and at a competitive price. They gave sound advice without any sales pitch and performed the chimney sweeping without mess or fuss. An all-round great service provider that we'll use again and again. Thanks, glad to hear your happy with the work. Chris was extremely knowledgeable , he did a great job no mess, and was quite honest in what we should do , to the point of costing himself work . Thanks for the review, sorry for not responding sooner. 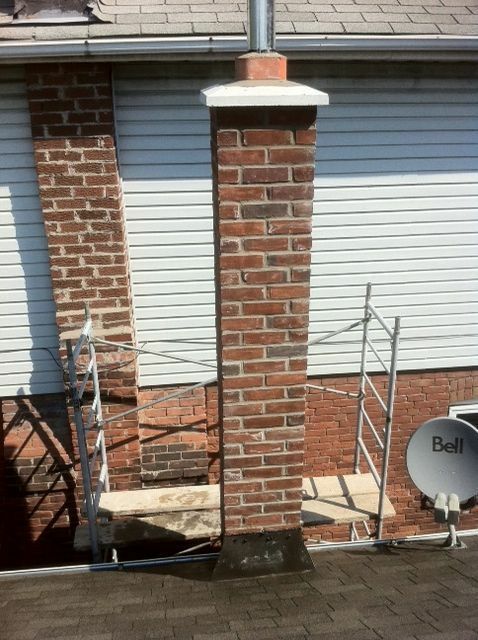 Metro Chimney specializes in chimney rebuilds, tuck pointing, and chimney sweeping and fireplace inspection services. 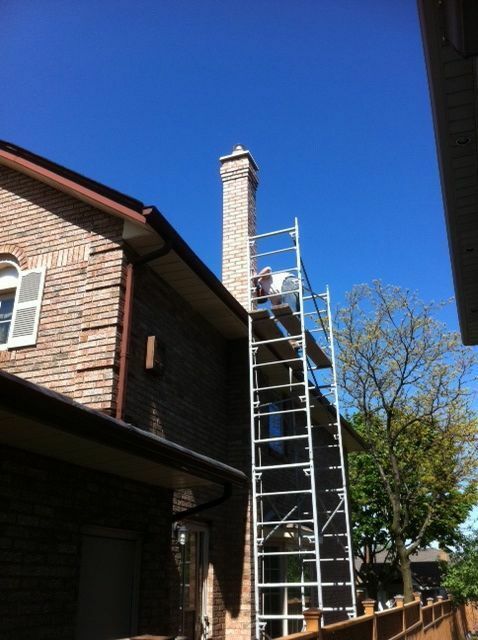 With our service yard located in the Leaside area, Metro Chimney has serviced countless homes in Rosedale, Moore Park, Forest Hill and the Yonge and Eglinton areas. Chimney and fireplace inspection is a very important part of fireplace safety. 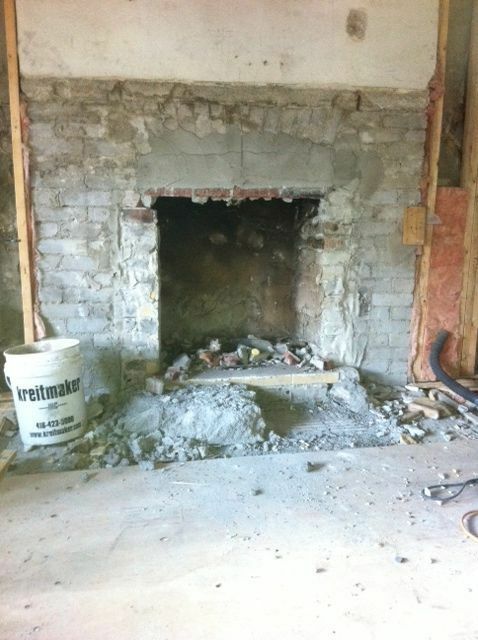 When you call Metro Chimney, we don't just show up to sweep your chimney, we inspect it with a WETT-certified mason who builds and restores fireplaces. 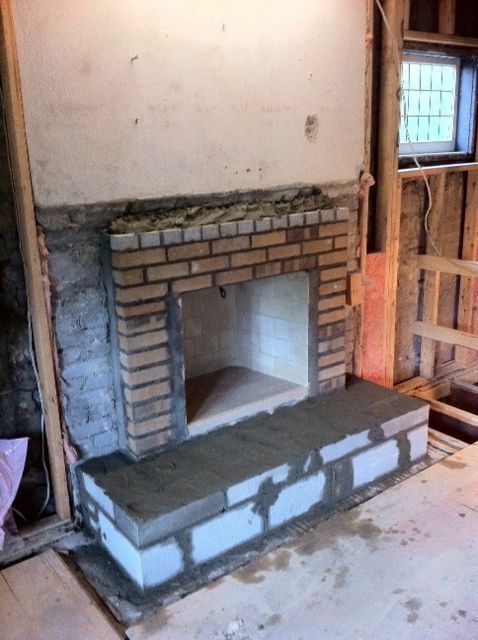 We provide fireplace restorations, firebox rebuilds, and more! When your no-mess chimney cleaning is being performed, we are looking at your hearth and hearth extension, your firebox and damper, as well as your mantel, smoke chamber and what type of liner you have. We are inspecting your chimney, above and below the roofline, looking at the brick or stonework for any damage that may require our attention. Call or email us today to find out more! Please call us directly to get the fastest service! Chimney rebuilds, masonry, chimney cleanings, rebuilding and repairing fireplaces, firebox repairs and restoration, and WETT inspections.